The global market cap of all digital currencies and tokens has risen to $507 billion at the time of writing, up by some $100 billion in just a day. While global trading volumes stand at an all-time high of $38 billion during the past 24 hours, with bitcoin handling much of it at $14 billion, but ethereum and litecoin trading volumes have both risen to around $5 billion each. 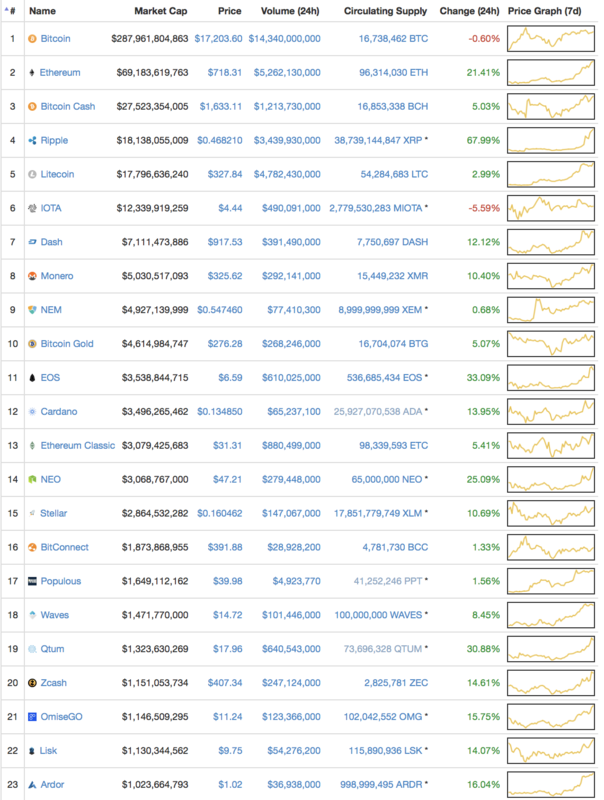 There are now 23 digital currencies and tokens at a market cap above $1 billion, with all in the top 13 standing at more than $3 billion. Ripple stands out as skyrocketing today for some reason, gaining a market cap of $18 billion while retaking its 4th position. While Litecoin, out of all currencies, has risen to a market cap of $17 billion, a level not far off from what bitcoin had at the beginning of the year. “How many unbanked people have we banked? How much censorship-resistant commerce for the common people have we enabled? How many dapps have we created that have substantial usage? Low added value *per user* for using a blockchain is fine, but then you have to make up for it in volume. How much value is stored in smart contracts that actually do anything interesting? How many Venezuelans have actually been protected by us from hyperinflation? How much actual usage of micropayment channels is there actually in reality? The rallying cry of the prodigy coder implicitly emphasizes just how important scalability is. We can’t help Venezuelans when some little kitties bring the network to is knees, and we can’t really begin thinking about micro-transactions when we can’t get even proper transactions to move through. However, markets don’t price just the present, but also price-in the likelihood of future developments, usually at a heavy discount due to uncertainty. Because if ethereum was at a level where Venezuelans could actually use it as an alternative for daily commerce, then how much would this very limited supply of 100 million eth be worth? The answer to that question is part of the calculation of today’s market cap. Which is why while many shout bubble, plenty think this is just the beginning, yet which is actually the case, remains to be seen.